'Velvet Toy' (Bonnie Dunbar by David Sindt, R. 1971). Seedling #69-2. MDB, 7" (18 cm). Midseason bloom and rebloom. Standards deep violet; falls deep violet with white ray pattern; white beard. Welch seedling #H-503: ('Sulina' x Cook seedling #1546) X I. aphylla dark violet. Riverdale Iris 1972. From AIS Bulletin #205 April 1972 Introducing VELVET Toy (Bonnie Dunbar). MDB. 7". EC 1971. $5.00. Sdlg. 69-2 ((Welch H503: (Sulina x Cook 1546) X 1. aphylla Dark Violet)). Rebloomers in Minneapolis are rare, but this little guy has consistently rebloomed for several years. Deep violet self, sporting a white ray pattern in the falls and a white beard. Branched, but the flowers are not crowded or down in the leaves. 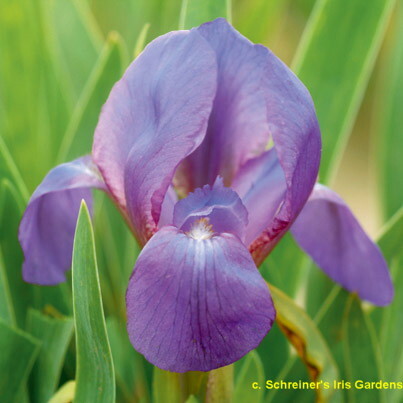 Best seedling at the Twin City Early Iris Show. Riverdale Iris Gardens.